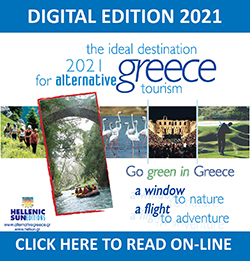 Hellenic Sun Editions Comprehensive solutions for tourist promotion worldwide HELLENIC SUN EDITIONS was established in September 1999 by experienced professionals committed to the international promotion of Greece and local tourist enterprises. The tourist market is increasingly becoming more demanding on promotional issues, looking for expertise, proper and effective promotional vehicles, response and essential communication. Each of our company's members and associates has an individual track record in the sector of tourist publications and the INTERNET; a track record distinguished by quality on all levels and personal care for each individual client. Our sustained aim and ambition is to offer exactly that quality and personal care through comprehensive proposals and solutions for tourist promotion by combining experience and enthusiasm, targeting to contribute to your successin the demanding new millennium and to upgrade tourism in Greece. 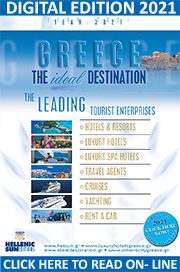 Through the publication of two unique tourist editions in English and German, HAPCO's publication "CONGRESSES IN GREECE - THE ULTIMATE CHOICE", the simultaneous distribution of a CD ROM containing all pertinent information, as well as through our very own INTERNET sites where we provide on-line hotel booking, as we as hotel reservation accommodation at: www.helsun.gr,www.idealdestination.gr, www.alternativegreece.gr, www.luxuryhotelsgreece.gr και www.conferencesgreece.gr we aim at an effective worldwide promotion of our country and its professionals. Get introduced to the leaders of the sector, give them a chance to get to know you and offer you their hospitality in Greece, contact them, or make an on-line hotel booking or on-line reservationaccommodation, and tell them that you found them at the sites of www.helsun.gr or www.alternativegreece.com. 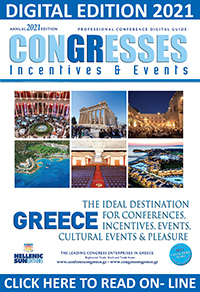 We invite you to contact us, to make an on-line hotel booking or an on-line hotel reservation, and give us the opportunity to prove that Greece is an ideal year-round destination and top choice for holidays, congresses and incentives for alternative forms of tourism. For complete information on HELLENIC SUN EDITIONS please contact us at telephone numbers: +30 2109337037, 210 9333843, fax number +30 210 9312831 or send us an e-mail: sales@helsun.gr.